In California, 136,787 students, from the graduating class of 2011, took an AP exam during their high school career. From that number, 90,409, or 66 percent, achieved at least one AP exam score of 3 or higher – scores that are predictive of enhanced college success, according to the College Board, the not-for-profit membership organization that administers the AP Program. In 2010, the most current data available, California’s 12th grade student population numbered 405,087. * The 8th Annual AP Report to the Nation California State Supplement, February 8, 2012. The College Board. * California State Integrated Summary Report, 2010-11. The College Board. * California Department of Education Statewide Graduation Rates, 2009-2010. * “Preparing Students for Success in College,” Policy Matters (2005), American Association of State Colleges and Universities. * Chrys Dougherty, Lynn Mellor, and Shuling Jian, “The Relationship Between Advanced Placement and College Graduation” (2005), National Center for Educational Accountability. * The College Completion Agenda 2011 Progress Report (New York: The College Board, 2011). A court decision this week involving Los Angeles Unified has raised again the contentious issue of evaluating teachers using standardized test scores. But a recent report for the think tank Education Sector recommends adopting the same method developed by Los Angeles Unified to replace the Academic Performance Index as a statewide way of measuring schools’ progress. 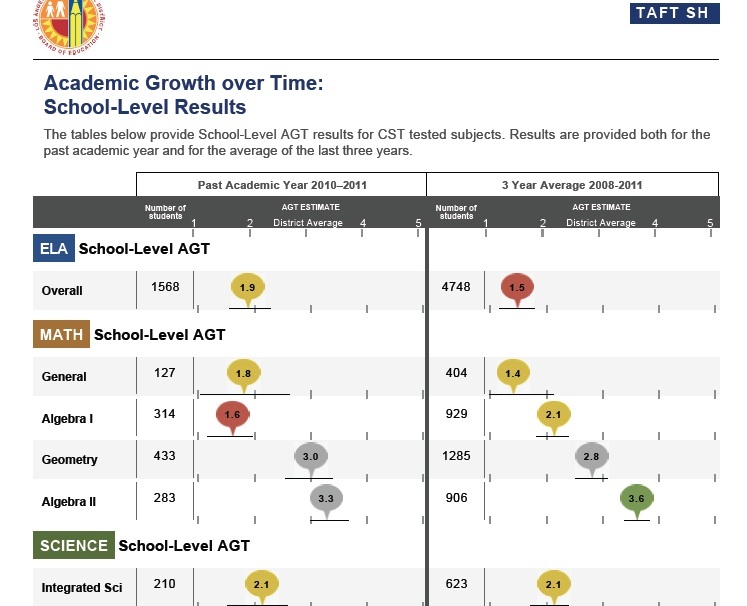 Called Academic Growth over Time, AGT is a value-added model that compares students’ actual performance on state tests to their predicted performance based on demographic characteristics – family income, language, and ethnicity – as well as past test scores. The intent is to distinguish factors of learning that schools can control from those they can’t. 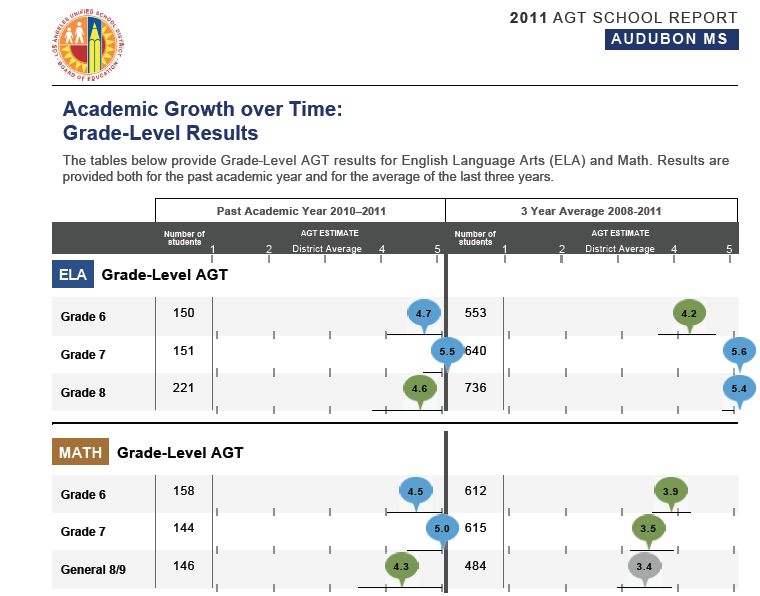 Last fall, for the first time, Los Angeles Unified released AGT report cards for all schools, breaking down every subject or grade taught on a scale of one to five, with students’ actual scores compared with where they should have been, given student populations, for a one-year and a three-year average. 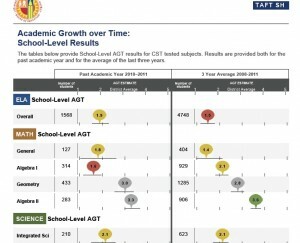 The AGT’s advantage is that it can highlight improvements in high-minority, high-poverty schools that may flunk under the federal and state accountability criteria, while pointing to mediocre performances in high-wealth schools that can glide by the targets of No Child Left Behind and the state’s API. The Education Sector report pointed to Audubon Middle School that, under a new principal and re-energized staff, had a 12 percent gain in the API score in one year. But it was still in the bottom 20 percent and failed to meet the proficiency target under NCLB for the 10th straight year. It doesn’t track individual students’ academic growth over time; progress is measured by comparing how students in a particular grade or subject do one year, compared with different students the previous year. The Legislature had intended that the API be a wider index when it created the index in 1999, but nothing has changed. Now, for the second year, Senate President pro Tem Darrell Steinberg has proposed SB 1458 to broaden the API to include possible factors as graduation, dropout rates and college acceptances, and Advanced Placement scores, along with giving science and other subjects more weight. In a nod to Gov. Jerry Brown, who suggested the idea, Steinberg’s bill could include the results of school inspections measuring non-quantifiable but important factors like school climate and parent evaluations. 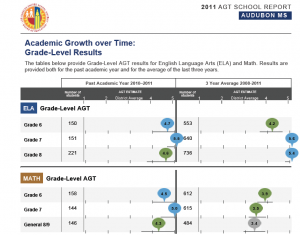 There’s no reason why a new index that emerges – whatever it’s called – couldn’t also incorporate AGT as a measure of student progress in combination with proficiency rates on state tests. Colvin said that the costs for districts to compute the AGT scores for its students need not be significant; Colorado has developed an open-source model that districts or the state could buy for $250,000. State Board of Education President Michael Kirst said he was open to innovative accountability models, but that now is not time to switch to value-added method. The state will begin using Common Core assessments in 2014-15, and at least two or three years of new data would be needed, bringing the adoption of a new system to 2018-19 at the earliest. The State Board will be reviewing the state’s accountability methods over the next year. Colvin called for making a commitment to AGT now and preparing for a transition. The State Board could grant waivers from the use of API to districts like Los Angeles Unified in the meantime. But Los Angeles Unified Superintendent John Deasy told me the district was interested in a federal waiver from No Child Left Behind, not a state waiver, so that it get out from federal sanctions for school failures as the feds defined it and also gain more control over federal Title I money. After months of delay, the state has requested an NCLB waiver, but not on terms requested by the Department of Education; getting the waiver would appear problematic. So here’s a question: If the No Child Left Behind law really does go away, and if we really do adopt a whole new set of tests, are we still “closing the achievement gap”? For years now, if someone said their goal was “equity,” it was a fair bet that their work was to close the gap on the California Standards Tests. Of course, there have been skeptics who argued that the test was too narrow and pointed out that the test is not sufficiently tied to the real-world goals of “college and career readiness.” But most of the equity work of the past decade has focused on strategies to boost the test scores of chronically low-performing students, increase enrollment and success in “gatekeeper” courses like algebra, and increase the number of students who are “college and career ready” – for example through policies about enrollment in “A-G” courses or the adoption of what are now called “Linked Learning” approaches. All of these strategies seem important. All appear to yield gains on the specific metrics to which they are aligned. Yet after a decade or more of work, do we have a more equitable system of schools in this nation? I think most observers would say no. We have some schools and even more classrooms that are more equitable; a few of these dramatically so. This is progress and worth celebrating, especially since this work is an uphill battle in a society in which the distribution of income and opportunity is becoming less and less equitable. But despite hard work by many people, we do not yet have a dramatically more equitable system of schools, and such a system is badly needed. And it is only by creating a far more equitable system of schools that the public education system can be what this nation needs it to be: not just the engine of our economy but also the backbone of our democracy and the route for individuals to achieve their own American dream. Resource allocation: Do poor students and students learning English receive more resources than others? Do struggling students, struggling teachers, and struggling schools receive extra support? Community engagement: Do parents and community members feel connected to and engaged with the schools that serve them? Are schools able to respond to parent needs and concerns? Are parents living in poverty, parents with limited English, and parents of color equally engaged? Social capital for students: Are students supported by the kind of web or network of supportive adults that will help keep them in school and make them resilient in the face of life’s challenges? Are students living in poverty, students learning English, and students of color equally supported? Are they engaged in school? Professional community for adults: Do all the adults in the system feel a sense of personal and professional efficacy, that they can bring their whole selves – hearts and minds – to work every day? Do adults feel accountable to students and parents, including those who don’t look like them? Do they feel accountable for educational outcomes for all of their students and for helping to build a more equitable school system? Customer satisfaction and system responsiveness: Do parents and students feel satisfied with their schools? It is easy to argue that these things might be important, but they aren’t easily measurable. That’s a problem. But if in the past we’ve settled for accurate measures of some of the wrong things, should we experiment with some less accurate measures of things that matter more, or at least that matter differently? As we move into a world in which the simple definition of equity as “closing the achievement gap” on a test no longer seems sufficient, we need to think differently about the goal of equity work: a far more equitable system of public schools in this nation. Merrill Vargo is both an experienced academic and a practical expert in the field of school reform. Before founding Pivot Learning Partners (then known as the Bay Area School Reform Collaborative, or BASRC) in 1995, Dr. Vargo spent nine years teaching English in a variety of settings, managed her own consulting firm, and served as executive director of the California Institute for School Improvement, a Sacramento-based nonprofit that provides staff development and policy analysis for educators. She served as Director of Regional Programs and Special Projects for the California Department of Education. She is also a member of Full Circle Fund. When I was a young child, every Saturday morning I would watch cartoons, especially Batman. Although people may think it’s a cliché for children to be inspired by superheroes, the feeling children get from watching people who can change the world into a better place touches a true emotion. I don’t have superpowers, but I do have the power to speak out for my community, to tell my story as an inner-city young woman of color in a public school. On Thursday, I will head out to Sacramento with students and parents from different cities and different backgrounds from all over California to fight for a better education for all students in California. I don’t want to be just another statistic on a piece of paper. I want to write my own destiny. I have committed to making my voice heard and creating an impact on the people around me. Education is very important, not just because it is a part of my everyday life, but because it molds my future. What inspires me about Batman is that he isn’t privileged with innate superpowers like the other superheroes. He taught himself how to effectively fight back against crime and injustice. He dedicated his own time and will to expand his mind and to train himself physically to fight crime so that innocent people don’t have to go through what he did – losing something or someone very close to his heart. Low-income students and English language learners are the victims of injustice in our school finance system. We are not privileged with luxuries economically, nor do we do grow up in safe neighborhoods. In spite of these challenges, we become the heroes of our own stories. We train our minds and bodies every day to be able to make it through without these advantages. When I look at privilege in some schools, I can’t help but ask, Why is it that some of us have to try so little and why do so many of us have to try much harder? Over the past three years, California has cut more than $2 million per day from our schools. The time to change our school funding system is now, with Gov. Brown’s proposal for a “weighted student formula” to give every student in California a fair shot at a good education. I support the general idea of the Governor’s new student funding formula, because it will direct much needed funding to students like me who live in poverty or need extra support to learn English. What I do not support in his proposal is giving total flexibility to districts on how to spend those funds. Total flexibility has hurt students in the past because of the lack of accountability. Giving district administrators the option to spend the funding as they deem necessary does not guarantee that those funds will be spent on the students the money is intended for: English language learners and low-income students. We simply cannot get this policy wrong. We need “targeted flexibility” to ensure that low-income students and English learners will directly benefit from additional money. Let districts decide on which programs and services to spend flexible funds, but require that those services benefit the intended students. We should build in accountability measures to make sure we see where the money is being spent. Even though some people argue that now is not the time to pass a new weighted student formula, why isn’t it? How much longer do we disadvantaged, unprivileged students have to wait? We are done waiting for someone to help us and have taken it upon ourselves to become the Dark Knight of Educational Justice. Today, together with hundreds of students and parents, we descend upon the State Capitol to bring justice to an inequitable school finance system that has deferred our dreams for too long. Today, we become the heroes of our own story. Citlali Hernandez is a sophomore at Wilson High School in Long Beach and a student leader with Californians for Justice (CFJ), which spearheads the Campaign for Quality Education. For being so young, kindergarteners have incited more than their share of quarrels in California. State lawmakers and governors argued for a decade about how old kindergarten students should be, before voting in 2010 to raise the age to five. At the same time, they created Transitional Kindergarten (TK) for those who miss the new cutoff. Gov. Brown is currently trying to repeal the TK component. Then there’s been the ongoing debate among experts over full-day versus part-day kindergarten, and how much play time in either the short or long day ought to be given over to real academics. The 3 R’s are winning. Now, flying in a bit under the radar are two bills that would make kindergarten attendance mandatory in California. That kindergarten isn’t already required might surprise some people, but only 16 states and Washington, D.C. require kindergarten. Like California, New York is considering a change in its law. What is required in California is that school districts offer kindergarten; it’s up to parents whether to send their children or wait until first grade to start them in school. Not surprisingly, the bills are causing people to take sides in the schoolyard. Last week, in a party line vote, the Assembly Education Committee approved AB 2203, by Assemblymember V. Manuel Pérez (D-Coachella), which would lower the age that California kids must start school from 6 to 5. Tomorrow, the same committee is scheduled to vote on AB 1772, introduced by Assemblymember Joan Buchanan (D-Alamo). Her bill has a slightly different take on the idea. Rather than changing the compulsory education age, AB 1772 makes kindergarten a mandatory prerequisite for enrolling in first grade. Today’s youngest students are learning to read, do simple math and even understand scientific concepts, like knowing that water can change back and forth from a liquid to a solid state. “In essence, it’s the new first grade,” San Francisco kindergarten teacher Catherine Sullivan testified at last week’s committee hearing. Although it’s voluntary, kindergarten is very popular in California. According to the state department of education, nearly 472,000 of eligible children attended public or private kindergarten last year – somewhere between 90 to 95 percent. But elementary school teachers say those 25,000 to 50,000 children who don’t attend are at a serious disadvantage. The bills seem to have caught some education advocates off guard. The California School Boards Association just started querying its members last week. As of yesterday, the California Kindergarten Association hadn’t seen the bills. And the Association of California School Administrators will be discussing it at next week’s board meeting. But it’s not an entirely new issue in California. As far back as 1997, a similar measure failed in the Senate Education Committee. Another bill never made it out of the Assembly Appropriations Committee in 2008. In between, former Gov. Gray Davis vetoed a bill and, in his veto message, gave opponents of AB 2203 and AB 1772 some key talking points. “Democrats take away parental freedom: mandatory kindergarten bill passes Democrat-controlled committee in California,” warned a headline in last Friday’s issue of the online publication, All Right Magazine (subtitled all right, all the time). “Our parental rights and home school freedoms in California are under attack in an unprecedented way this year,” wrote the Home School Legal Defense Association in an E-lert on its website. John Fensterwald co-wrote this article. It has been updated to include a comment from the president of the district’s teachers union. Despite the worst education funding crisis in decades, a California school district boosted achievement enough to win a spot in the final four of the 2012 Broad Prize for Urban Education. The 53,000-student Corona-Norco Unified School District in Riverside County is in the running for $550,000 in college scholarships from the Eli and Edythe Broad Foundation. The Broad Prize statue, comes with $550,000. (Source: Broad Foundation website) Click to enlarge. 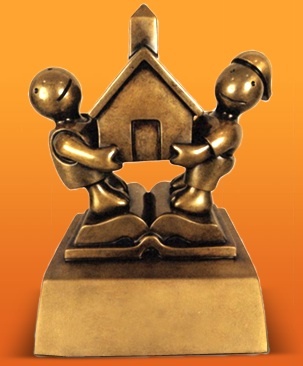 Since the Broad Foundation began awarding the prize ten years ago, two California districts have received top honors: Long Beach in 2003 and Garden Grove the following year. Both were also finalists several times (there is a three-year fallow period after winning), as was Florida’s Miami-Dade County Public Schools, which is one of the other three finalists this time around, along with nearby Palm Beach County and the Houston Independent School District. Runners-up each receive $150,000 in college scholarships. Those districts are then placed into a computer centrifuge of sorts, where they’re analyzed on a slew of criteria, such as how well students perform on state standardized tests; whether they’re closing the achievement gap by race, ethnicity, and family income; graduation rates; the number of students taking AP classes and passing the exams; participation rates and scores on the SAT and ACT college entrance exams; and student demographics by race, ethnicity, family income, English learners, and special education students. The review panel gets a binderful of information on each district. “There’s an incredible amount of data that we see. The work that goes into this is really substantial,” said Christopher Cross, a member of the review committee and former Assistant Secretary of Education. Cross is especially interested in making sure that a district’s improvements are sustainable. “It’s not a question of just having a good year, you have to have performance over time, ideally over four or five years,” he said. In its press release announcing the finalists, the Broad Foundation cited several areas in which Corona-Norco stood out. Last year, African-American students ranked in the top 10 percent in reading and math on the California Standards Tests. Between 2008 and 2011, both participation rates and scores on college placement and Advanced Placement exams increased for Hispanic and African-American students. EdTrust-West found similar improvements in its annual district report cards released last month. Out of 147 unified districts measured, Corona-Norco ranked sixth overall, and stood out in particular on college readiness. Between 2010 and 2011, the number of African-American seniors who had completed the A-G courses needed for admission to Cal State and the University of California increased by 16 percentage points; for Latinos it was 10 percent higher. For Superintendent Kent Bechler, 55, the Broad nomination is a great honor on his way out. Two weeks ago, he told Corona-Norco trustees that he plans to retire at the end of this year after five years leading the district. He learned of the Broad Prize honor Wednesday as he was heading to New Zealand on vacation and so couldn’t be reached for comment. Corona-Norco School Board President Bill Newberry and other top administrators credited Bechler for guiding academic improvement. “He’s a superior leader,” Newberry said. “Training, from school board members on down, is important to him.” Every Wednesday, every school has an hour of collaboration time either at the start or end of school – a practice Bechler instituted. In part due to a wave of retirements, Bechler has appointed new principals at the district’s five high schools, most of the middle schools and many elementary schools. “He made sure that the leadership in the district office and in schools aligned with core values and expectations,” said Assistant Superintendent Robert Taylor. (Updated) Bechler’s leadership also gets high marks from Bill Fisher, the president of the Corona-Norco Teachers Association, who attributed much of the district’s success to Bechler’s commitment to collaboration and problem solving. That has enabled the CNTA to become “more of an association and less of a union in working directly with the district” over budget cuts and scheduling. (The union has taken two straight years of 5 percent pay cuts to avoid layoffs.) And Bechler has brought in and promoted good leaders, Fisher said. Even Broad Prize finalists, however, can find themselves ensnared by the No Child Left Behind law. In 2010, Corona-Norco became a Program Improvement district because it missed seven of 42 targets, some by a few percentage points, some by double-digits. Latino, African-American and low-income students for the most had made steady progress, but not enough to keep up with escalating targets in math and English-language arts. The screening jury considers failure to make Adequate Yearly Progress goals under NCLB goals as one factor of many, said Broad Foundation spokeswoman Erica Lepping. School districts don’t pay much attention to the criticisms. The prize elevates them to model status. Superintendents are asked to speak around the country; other districts send administrators and teachers to visit and learn how to replicate the successes. “I’ve heard of superintendents being hired who have told the committees, ‘You hire me and I’ll make you a Broad finalist or a Broad winner,'” said Cross. Over the next few months, Broad will send teams of researchers and educators to each of the four finalists districts for a week-long site visit where they’ll observe classes, conduct interviews and meet with parents and community leaders. All that information goes to a different review panel, known as the selection jury, which decides who gets the top prize. The winner will be announced on October 23 in New York City. The gap starts early in elementary school, widens in middle school, and continues, through filters and barriers, on a trajectory of low achievement and missed opportunities. By the end of college, the number of Latinos and African Americans who graduate with degrees in science, technology, engineering, and math is a trickle: an estimated 1,688 from the University of California and California State University in 2008. “The vast disparities in STEM preparation existing between underrepresented students of color and their peers in California are problematic in both the limited future opportunities afforded to these students and the significant loss of a large pool of talent for the state,” concludes Dissecting the Data 2012: Examining STEM Opportunities and Outcomes for Underrepresented Students in California. The report is from the Level Playing Field Institute, a nonprofit that offers intensive STEM summer programs at top-ranked colleges for promising minority high school students. The report is an update from 2010; the data haven’t changed much, which makes the statistics all the more compelling. The Center for Education and the Workforce at Georgetown University projects that California will need to fill 1.1 million STEM jobs in six years, with 93 percent of those requiring postsecondary degrees. Experts have fretted about the lack of students going into many STEM areas, including computer science, physics, and engineering. The scarcity of African American and Latino students in STEM heightens the problem. The two comprise 59 percent of California students, yet in 2010 comprised 15 percent of STEM enrollment in UC and 26 percent in CSU for a systemwide total of 21 percent. The narrowing of the pipeline begins early, the study notes. 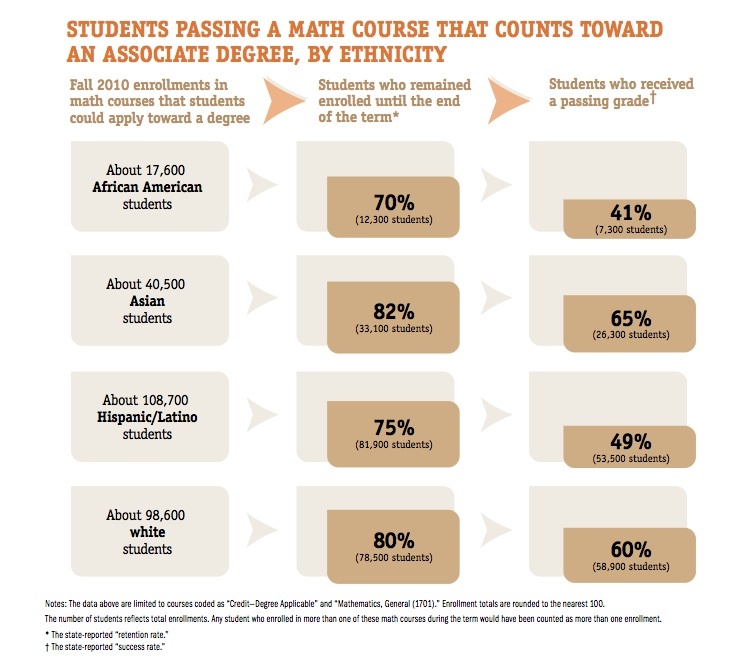 In second grade in 2011, 51 percent of African American students and 57 percent of Latino students were proficient in math, compared with 78 percent of white and 86 percent of Asian students; in fourth grade, the gap narrowed a bit as all groups upped proficiency. But by sixth grade, the slide began: 42 percent proficiency for Latinos and 35 percent for African Americans, 33 percentage points below whites and 46 percentage points below Asians (see chart). The pattern has been set for algebra in 8th grade, considered a gatekeeper for students in California who want to major in STEM in college; most African American and Latino students take Algebra in 9th grade, but of those who took it in 8th grade last year, 29 percent of of African American and 37 percent of Latino students tested proficient, far below whites (58 percent) and Asians (76 percent). On the National Assessment of Education Progress, or NAEP, African American students in 19 states and Latino students in 34 states scored significantly higher than their peers in California. Rates for proficiency and above on state standardized tests get worse for those who take Geometry (13 percent African American, 18 percent Latino, 42 percent white, and 60 percent Asian) and Algebra II (16 percent African American, 21 percent Latino, 39 percent white, and 61 percent Asian). In fifth grade, where science is first tested, 43 percent of African American and 45 percent of Latino students reached proficiency and above, compared with 80 percent of white and Asian students. The data for high school science becomes bleaker. On state Biology, Chemistry, and Physics standardized tests, African American and Latino proficiency rates were between one-half and one-third of white and Asian students’ rates (see chart). Psychological barriers: a lack of role models in STEM fields and the perception that the fields are too challenging or unwelcoming to them (this gets worse in college). Not mentioned, although documented in a recent study by the Center for the Future of Teaching and Learning at WestEd, was the lack of engaging science instruction in many low-achieving districts, where pressure to raise English language arts and math scores have crowded out science instruction in elementary schools. In high school, disadvantaged minorities are underrepresented in AP STEM courses; Latinos, with 49 percent of the K-12 population, took 18 percent of AP science courses, while Asians, with 9 percent of student enrollment, took 38 percent. Latinos and African American students scored considerably lower on SAT tests and the state’s Early Assessment Program: Only 5 percent of African Americans and 7 percent of Latinos were ready for college-level math by the end of their junior year. The deficits these students face in high school limit their opportunity for a STEM major in college. In 2010, about a quarter of students at CSU and UC – 152,643 undergraduates and graduates – were in STEM majors; 3 percent were African American and 18 percent were Latino. For the freshman CSU class of 2004, only 13 percent of African American and 22 percent of Latino students graduated with a degree in STEM within six years, compared with 39 percent of whites and 31 percent of Asians. So, what to do to widen the STEM pipeline? The study suggests better teacher training for STEM teachers, more hands-on science activities in elementary and middle schools, mentorships and activities like robotics in high school, and increased access to AP courses. The report also urges the expansion of summer bridge programs that prepare minority students with an interest in and grades for STEM careers to take challenging courses and prepare for college. The Level Playing Field Institute’s SMASH Academy, which I wrote about last year, is one such program, and, with private donations, plans to expand this summer to UCLA. But public dollars are getting scarcer for outreaches like MESA (Mathematics, Engineering, Science Achievement, funded by the president’s office at UC. And Gov. Jerry Brown is proposing to eliminate $11 million in state funding for AVID, one of the more effective college guidance and preparation programs for minority students. Every year about 220 students at De Anza College in Cupertino voluntarily sign up for a yearlong double dose of math classes. It’s not easy to get in; about 700 students at the community college apply for the program, known as Math Performance Success (MPS). The main requirement for admission – besides applying early – is having a bad history with math. These are students who have failed a math course once or twice, or who have dropped out of the class. Over three consecutive quarters, the program takes students from basic skills, such as elementary algebra, through college-level statistics, which is one of the required courses for students planning to transfer to the University of California or California State University. Over nine years, from 2001 to 2010, pass rates for MPS students were 18 to 28 percent higher for each course than for students in the traditional sequence. It’s a resource-heavy program. Students get tutoring, counseling, and extra-long classes. For faculty, there’s built-in collaboration among fellow teachers and with support staff. 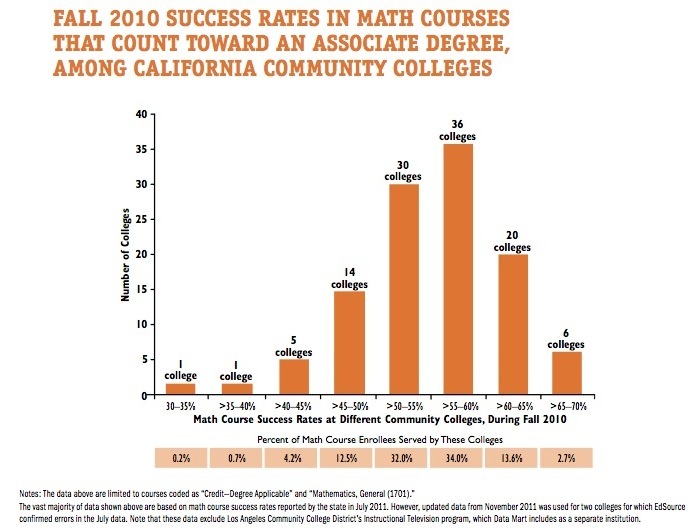 In most California community colleges, just 55 percent of students taking college-level math classes will pass them with a “C” or better; a new report from EdSource found that rate hasn’t really changed in 20 years. 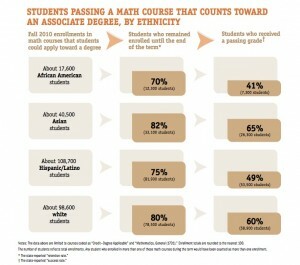 Passing rates of college-level math by race and ethnicity. (Source: EdSource) Click to enlarge. math are struggling to pass. Those rates vary by race and ethnicity. African American students passed 41 percent of the time; Latino students had a 49 percent pass rate; it was 60 percent for white students and 65 percent for Asian students. But those figures only apply to students who remained in the courses; between 18 and 30 percent dropped them. Her own research found that how well and how quickly students complete college-level math in community college turns out to be a strong predictor of success. Steps to Success, a 2009 report that Shulock co-authored, found that students who passed college-level math within two years after enrolling in a community college were nearly three times as likely to earn a certificate or degree or transfer to a four-year college as students who didn’t finish in that time frame. 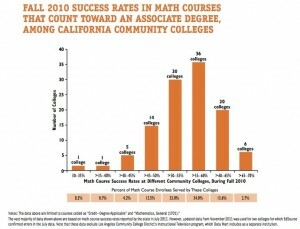 Variations in passing rates by community college. (Source: EdSource). Click to enlarge. It may also be a factor of geography. In communities hit hard by the economic downturn, students may also be working full time and dealing with the stress of earning enough to pay the rent, feed their families, and pay for child care. John and Kathy co-wrote this post from Sacramento. For the second time in as many months, the acting Assistant Secretary of Education came to California to call on the State Board of Education to apply for a waiver from most of the requirements and penalties of the No Child Left Behind law. All but ten states have either formally applied for a waiver or indicated they would in the next round. California is the only one of the ten that Michael Yudin has visited. Yudin’s pitch seems to be working. Just two months ago, Board members were skeptical of the costs and the conditions that would come with the waiver and declined to take any action. On Wednesday, they directed staff at the state Department of Education to start gathering information for a potential vote at their next meeting in March on applying this summer. Even State Superintendent of Public Instruction Tom Torlakson now seems amenable. When Education Secretary Arne Duncan first proposed the waivers in September, Torlakson balked at what he projected to be a $2 billion cost and rigid conditions for meeting the waiver. “If the administration understands the complexity and the diversity of the state of California, and the financial pressure we’re under, we would design a customized waiver. I believe there is opportunity here,” said Torlakson. As Torlakson knows, without a waiver no Title I school in California will meet NCLB’s demand that every student score proficient on the California Standards Test. When that happens, they’ll also lose control over a significant portion of their Title I dollars and face a narrow range of federally prescribed improvement options. Concern over losing that money drew nearly a dozen superintendents from around the state to Sacramento yesterday to plead with the Board to seek a waiver. “This is a point of desperation,” said Sanger Unified Superintendent Marc Johnson, whose tiny 11,000-student district stands to lose control of $500,000. Sanger has been using that money on its own intervention programs, which he credits with increasing the district’s high school graduation rate to 94 percent. “Children in this state will be harmed because of the failure of state agencies to take action and embrace this,” said Johnson. He and the other superintendents said the Board needs to be aware of the demoralizing effect of having schools be labeled as failures and the burdens that come with sanctions. Waivers wouldn’t even be an issue if Congress had reauthorized NCLB five years ago, as it was supposed to. There’s a consensus on Capitol Hill and in the Obama Administration that the bill has major flaws that have to be fixed. Yet there’s little chance of that happening before the November election. The Obama Administration is offering states the opportunity to create their own school improvement models, but with new conditions that in some ways are more far-reaching. A new accountability system for closing the achievement gap: The Administration wants the states to develop interventions for students in the lowest-performing 5 percent of schools and, in a new requirement, for students in schools with the largest achievement gaps – 900 schools in California. Accelerated implementation of Common Core standards and career and college readiness standards: The state is well on its way to meeting these requirements. Several of these and other factors have given the Board pause. A key concern is that these conditions – especially teacher and principal evaluations – would become mandates for all schools, not just Title I schools, which the state would have to fund. Board members also pressed Yudin about what happens three years out when either the waiver ends or the federal government, under NCLB’s successor, seeks to impose new sanctions if they fail to meet the requirements of the waiver. Would they lose money or be reinstated in Program Improvement? Yudin wouldn’t predict the future, given the uncertainty of possible partisan shifts in Washington, D.C. But he did try to allay fears of the costs and stress the flexibility that California would have in designing its plan. The California Teachers Association in particular has opposed any use of student test scores in evaluating teachers. But Yudin said that the federal government is offering a lot of latitude to the states. He noted that Massachusetts, a recipient of Race to the Top funds and one of the 11 states that has already submitted a waiver application, will only be using test scores to validate the accuracy of the other measures. Meanwhile, Alice Petrossian, president of the Association of California School Administrators, promised the State Board that ACSA would take the lead in developing criteria for evaluating principals. For the past year, ACSA been working on the issue and potential legislation. The cost of these programs, said Yudin, could in large part be borne by money the federal government is already providing to the state. This includes $268 million in Title II professional development money that could go toward teacher training for Common Core and teacher and principal evaluations. An additional $239 million in Title I dollars that Program Improvement schools currently have to set aside for federal interventions would be freed up for the alternative plans that the state would create. Despite these assurances from Yudin, several Board members remained uneasy about potential costs to the state and the short two-to-three-year timeline to get all these new statewide programs up and running. “Would you relax requirements to move forward in a timely way because of the fiscal constraints facing states?” Carl Cohn asked Yudin. Yudin said the states would have a lot of leeway in what they propose as long as the plans are implemented statewide within three years; however, he emphasized that this is not a competition where states will be scored against one another. Pushing aside reservations was Board member Yvonne Chan, the principal of a national blue ribbon charter school that is now in Program Improvement. “I strongly urge you to think outside the box,” Chan, whose term ends this week, urged her colleagues on the Board.